We woke up with a start. It was a noise we had often heard before and should have been no surprise to us but tonight for some reason it woke us from our slumber. It began some distance away, a steady vibration, which became a hum, which developed into a heavy drumming and finally into a thunderous roar. Im getting ahead of myself though. Winter nights between the Kalahari and the Makgadikgadi Salt pans in Botswana is never to be misunderstood. It’s freezing outside, so cold the water in the glass at your bedside turns slowly to ice. It’s still, so still that not a single leaf is moving. It’s quiet, like a graveyard, most of the time. But tonight, tonight is different.Our camp was set on the edge of a dry riverbed, at the north end of a gentle curve leaving the banks of the river to our immediate south sharp and steep, and high. 3 storeys high. Where we were though, they were gentle and sandy and created a good access to and from the waterholes below. The lions were at it again. They used the river as a killing ground, especially at full moon. The light of the moon caused the vegetation on the banks of the river to cast shadows making it difficult for panicked animals to tell steady from crevassed ground, like a rabbit running along trapped in the headlights of a car unable to get off the road. In line with our tent was a place where there was no vegetation and this was where everything that was now in the riverbed being chased by the lions would be heading. We could hear the advancing stampede. Our tent was set on the edge of a dirt track overlooking an open plain. We were set under a huge camel thorn tree which was casting a shadow over the tent, even in the moonlight. A full moon in Africa is something to behold casting the landscape in an eerie blue light. Britt and I moved into position, we perched on the edge of our bed, covered ourselves with the down duvet and stared towards the river to our right. The sound became louder, the stamped closer and closer and closer still. We began to hear the Zebra leaving the river and coming towards our camp. 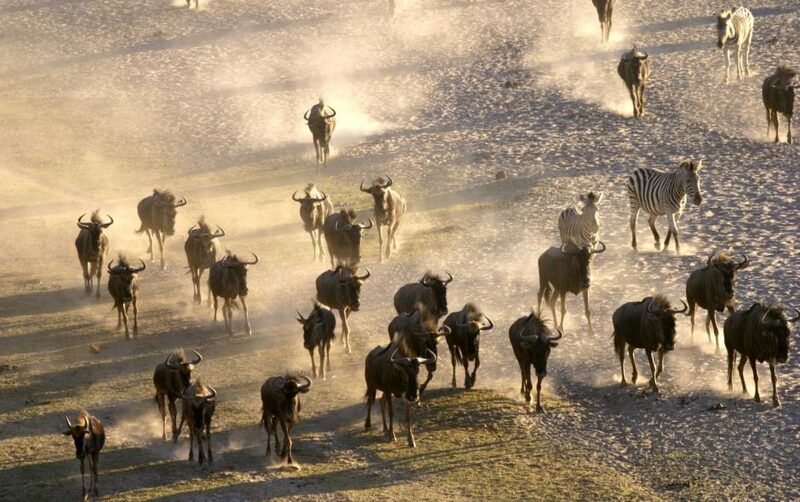 The stampede was not just the noise of hooves hitting the dirt, but also the panicked calls of the hundreds of Zebra trying desperately to keep track of each other and their young while being forced to flee from what is trying to eat them. The herd entered the plain and for the first time we could see them in the moonlight. As they ran they picked up the dust with thousands of beating hooves until the entire area seemed like it was covered in a mist that shone blue in the moonlight. Snapping past the door of our tent which was just gauze zipped closed, we could see the shapes of the Zebra snapping past, closer and closer to the tent until they were on the track just 2 meters from where we sat. The dust, the smell, the frantic panic was overwhelming and then suddenly in an instant, it stopped. Everything stopped. There was not a single noise, no hooves beating on the ground, no calls to locate each other. It was an eerie silence with the dust swirling like mist in front of our eyes. Out of nowhere we saw the shape of a Zebra flit through the mist followed very closely by a very much more lithely shape and we knew, the cats were here. Then we heard it all, the pounce, the struggle, and finally, the kill. The lions converged on the downed Zebra, it was a mother with her 4 sub-adult cubs, and to us she became known as Nikita, but on that night we were surrounded by a powerful display of predator and prey. We couldn’t see the kill, but we could hear the rest of the heard fading off into the bush and we could hear every mouthful the lions took. The following morning the cats were gone leaving nothing but the bones of a medium sized Zebra behind just 20 meters away from where we tried to sleep.